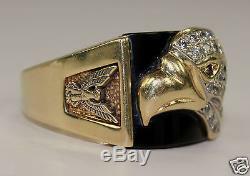 Vintage Men's 14k Yellow Gold Figural Ring with 3-Dimensional Head of an Eagle on Black Onyx with 0.3ctw Diamonds and a Ruby Eye. 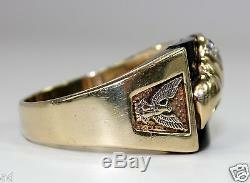 The 3-dimensional full eagle on the shoulder could be a military symbol emblem - so this may have been a custom made military ring. 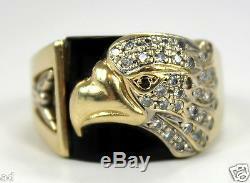 The eagle has always been a symbol of superior strength and intelligence. 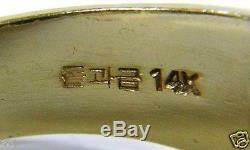 Marked: 14K (tested 14K) with Korean Hallmarks. 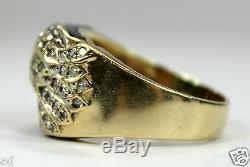 Size: 12.5 This ring could be sized by your jeweler if desired. 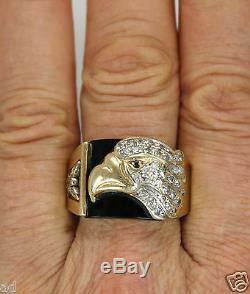 Measurements: The top of the ring with the eagle head measures approximately 15mm girdle length x 25mm girdle width. The shank measures approximately 5mm at the back and gradually increases to 14mm on the side which meets the black onyx top. 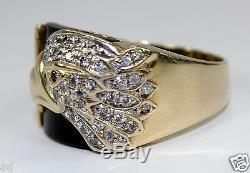 When worn, the ring sits approximately 1/4 above the finger. There are 34 round faceted diamonds, each approximately 0.01 carat, so there are approximately 0.3ctw diamonds. The round faceted ruby gemstone eye is also approximately 1mm round, or 0.01 carat ruby. 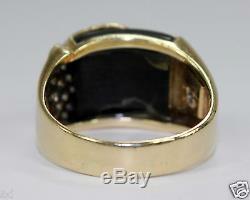 Good Vintage Condition: As to be expected with vintage jewelry, there are scratches in the gold metal commensurate with true age and wear. 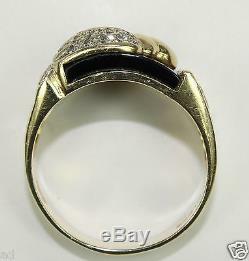 Some of the diamonds are chipped. In the Korean culture this signifies a long life of fortune and happiness. 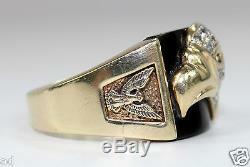 The pictures are enlarged to view the details. 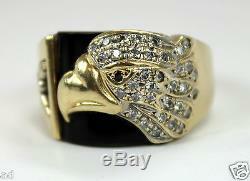 The item "Vintage Korea 14K Yellow Gold Mens Ring 3-D Eagle Figural 0.3ctw Diamonds Ruby" is in sale since Tuesday, June 03, 2014.